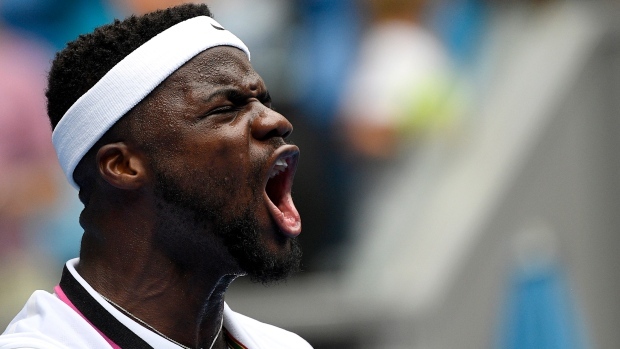 MELBOURNE, Australia -- Frances Tiafoe rolled up his white shirt's right sleeve, flexed his biceps and slapped the muscle five times. Then he pounded his chest and yelled, "Yeah! Let's go! Let's go! Come on!" Mackenzie McDonald pushed No. 6 Marin Cilic before losing 7-5, 6-7 (9), 6-4, 6-4, and Denis Kudla went to a fifth set before bowing out 6-4, 7-5, 3-6, 6-7 (6), 6-4 against No. 18 Diego Schwartzman. Reilly Opelka, a 21-year-old who eliminated No. 9 John Isner in an all-U.S. first-round showdown, held a 67-2 ace advantage -- and a 15-inch (38-centimetre) height advantage -- against Thomas Fabbiano but lost to the Italian 6-7 (15), 6-2, 6-4, 3-6, 7-6 (5).